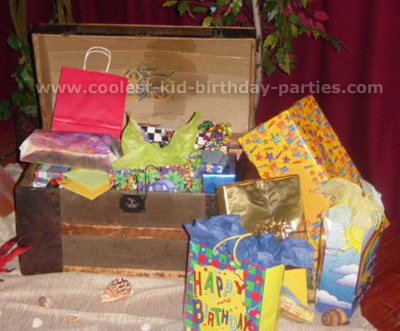 For my son Jacob’s 7th birthday we decided to have a pirate treasure party. We started with pirate invitations made on the computer on a scroll that read- “Ahoy Matey, you are hereby invited to walk the gangplank; Captain Morgan will be in harbor from (time) on (date) in search of a fresh crew and will find his way to (place) to meet suitable candidates – bold buccaneers wishing to set sail for a swashbuckling adventure party should come for a suitably attired exciting adventure”. The pirate invitation got a huge response. We created a pirate ship using tables turned on their sides. We covered them with cardboard and brown paper. Around the outside bottom of the ship we used blue tarps to resemble water; we also left 3 openings on the ship where the children loaded on and off the pirate ship and of course a plank that was an old door on top of big paint buckets. 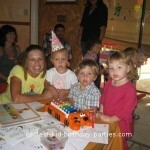 When the children arrived they all got a pirate bandana and an eye patch. 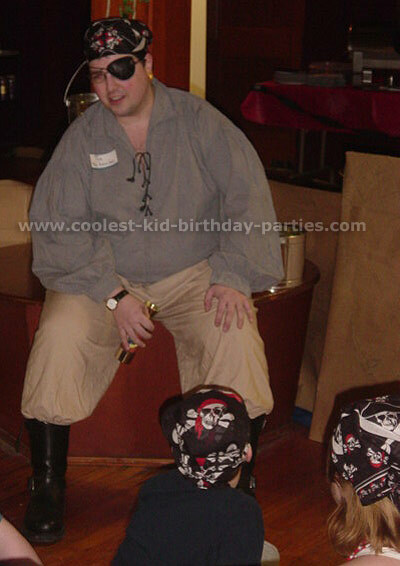 Jacob’s uncle dressed in full pirate gear and told sea stories to entertain the children as everyone arrived. We then had the grub, which was chicken fingers and cold pizza squares. The candy on the table was all gold and silver- Hershey kisses, nestle nuggets, and black and white MandM’s. 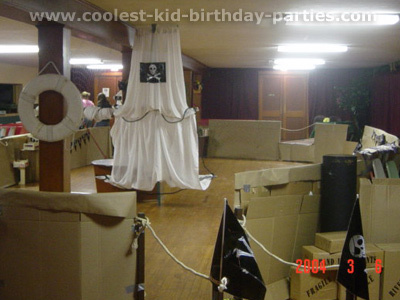 For pirate treasure games we had a treasure hunt first and all the treasures found had to do with the games then played black balloons for cannonball pop, a treasure chest piñata full of ring pops and a pirate treasure chest filled with the goodie bags. We also played musical X’s – played like musical chairs but instead of chairs we used pirate looking X’s. 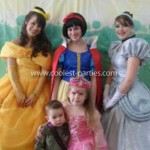 Cannonball pop – the children each got to pop a balloon and the one with the gem inside won a prize. After all that we headed off the pirate ship to ” Treasure Island ” where Jacob opened his gifts. 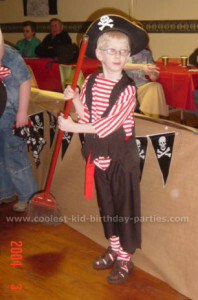 It was definitely a birthday he will never forget; his classmates still talk about the pirate party a year later!